Surprising even myself, nesting has remained in full swing over the past couple of weeks. We have cleaned out dressers and closets. I even convinced my husband to part with his drawer full of miscellaneous power/data cords and old cell phones. My excitement over my little closet nursery is still going strong. Two weeks ago it looked like this. 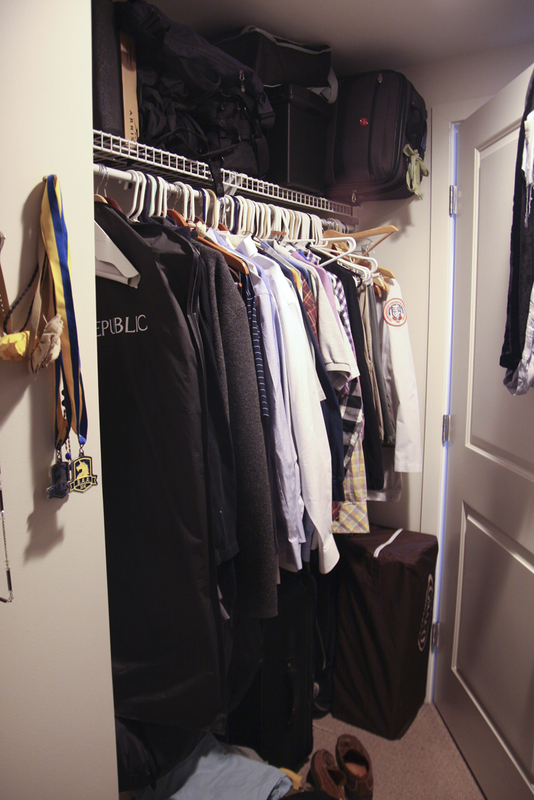 After some re-arranging in other closets and a little purging on my half, we were able to relocate everything. As I mentioned in my first post, I really like this little nursery nook, particularly the dots. 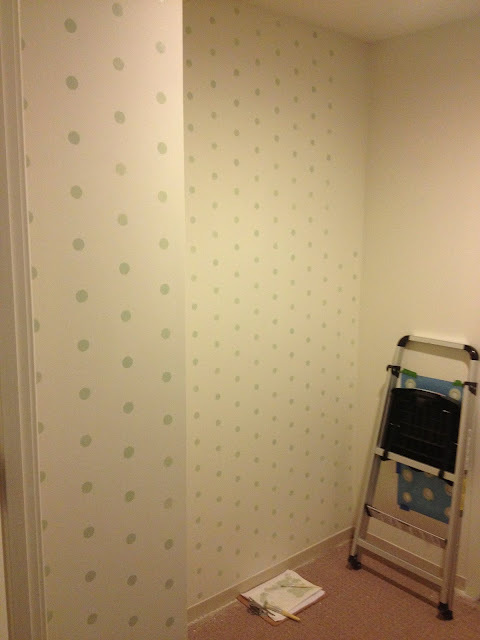 I liked that I would not have to tape the trim or the ceiling to stencil dots on the wall. I hate taping, worst part of painting if you ask me. I also would not have to tape when we move and I have to paint back over everything. win-win. So I looked online and found THIS ebay dealer to have the best prices for the scale I was looking for. After some online shopping, I also came to realize that mini crib bedding is pretty limited. 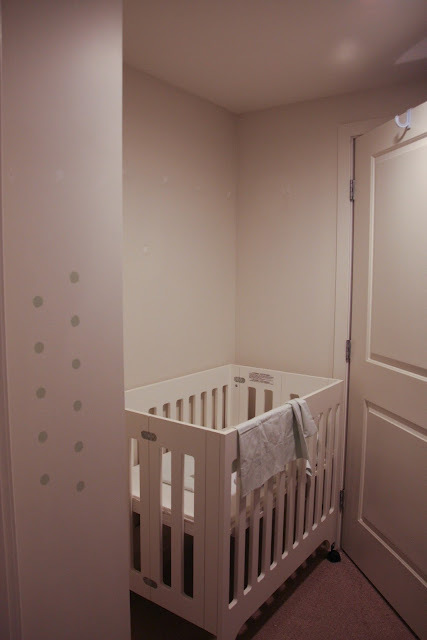 I had made crib sheets for Remi before he was born and used what I thought was a fairly nice cotton fabric, but they ended up pilling, so I didn't want to do that again. 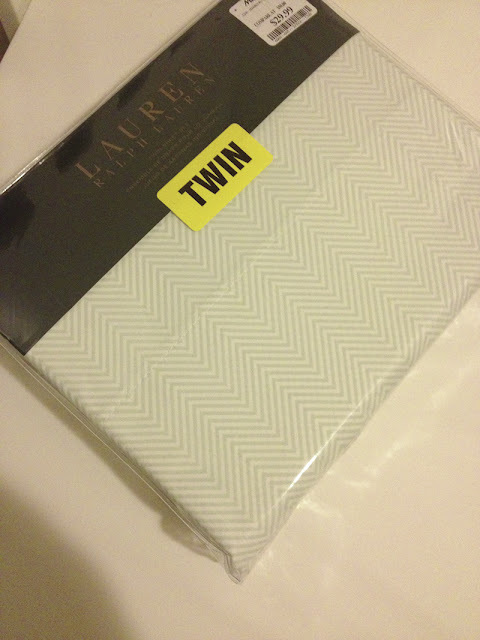 Then I got the idea to just buy regular size twin sheets and use the fabric. I found these at Marshalls for $30. Last week my stencil arrived. I took a late night trip to Home Depot with one of the pillow cases and picked out this muted green paint in a semi-gloss finish. I wanted to go a little greener than the sheets, but in the same saturation family. It's called 420E-3 Spring Hill by Behr. Bryan was on call Sunday, so I took down the clothes rack, patched the holes, and did a little practice run with the stencil, which I was very intimidated by. I did actually have to stop last night around 10:30 because A- my husband wanted to go to sleep and B-after a quick rinse to get the paint blobs out, my stencil brush went limp. No good. The warm water killed it. I guess I am going to have to buy another to finish. Luckily they are only $2. But like I said, I was initially super intimidated by stenciling. And I do think more complicated designs like the one I used for a client last month (which we paid a pretty to have done) would not be as easy as these dots. I looked at this tutorial before I started. The most important thing that took me a few tries to get the hang of was, go super light on the paint. It will make a much cleaner shape. But in my typical lazy fashion, I didn't use a level. I didn't use any type of spray adhesive. I just aligned the stencil with a couple of dots and kept working my way over. One other fyi, it does not take a ton of paint to do this. I could have bought a tester jar and would have been fine. I will show you how little I used out of the can when I am finished. Today I came across this little painting I found at my favorite antique shop in the Cape a couple of years ago and I think it's exactly what I want to put over the crib. And that's where I am with my little nursery in a closet! More to follow.